Gratitude to the organizers and hosts who've invited me to present at the following events. This event enacted by the Los Angeles Free Music Society will activate the space of the museum through sound. The improvised sound of the musicians will float through the galleries creating a potentially new take on the visual stimuli of the works in the collection. Originating in the space on the ground floor, the musicians will respond to one another building and contributing an intense listening experience. Made by Millworks, 240 Pine Avenue, Downtown Long Beach. Two-hour free parking at The Streets (formerly City Place) north side of Third Street, just east of Pine Avenue. 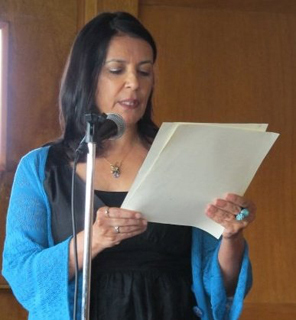 In collaboration with the GWC Art Gallery, LibroMobile presents: Southern Californian author liz gonzález will join local author and conceptual artist Sarah Rafael García in an interdisciplinary art talk focused on the journeys artists take to produce work that intersects personal identities with region and history. FREE! Free Parking on campus. The best location for this event is off Gothard. $10 Admission includes Snacks + Dessert. Tickets on sale NOW at www.ruskingrouptheatre.com. Look for Library Girl icon + click on Buy Tickets. In partnership with the Susan G. Komen Foundation, join us in a creative day with other women in your community. The program will commence with a lunch followed by an art-making workshop with Maria Ramos, LACMA Teaching Artist, and poetry with poet, liz gonzalez. This program is open to breast cancer survivors. liz gonzález at the Ugly Mug! Workshop for Writers: Leave the Audience Wanting More! Develop your public reading skills and gain confidence to share your work in front of an audience. Jorge Martin will perform an ambient music set after my reading. A reception with light refreshments and book sale and signing will follow our presentations. Copies of my book will be on sale by Los Nietos Press. SUGGESTED: Wear comfortable clothing and shoes appropriate for walking on dirt paths. A brimmed hat that will stay on in a breeze is recommended. If you prefer not to sit on the ground, bring a cushion or small blanket to sit on. FREE and open to the public. Donations to the Palos Verdes Peninsula Land Conservancy encouraged. Huge gratitude to the Palos Verdes Peninsula Land Conservancy for hosting us! ABOUT PARKING: A free dirt parking lot closest to the The Nature Center is available. "The parking area is open daily from dawn until dusk. Parking is available in the lot accessed from the west end Paseo del Mar from sun up to sun down. Please note that due to the landslide, access to White Point Nature Preserve is via Western Avenue." FYI: We come from Long Beach, so we park on the east side of White Point Nature Preserve on Paseo del Mar between S Weymouth Ave and Jackstadt St and walk in to save the trip of driving around to the lot.